I published another page in my Canadian Journal. It's really just a few highlights as I'm not really doing much with it these days so it's more like a reference for myself to refer to. You might be interested in viewing it as I posted up an article from McLeans's Magazine which compares Americans with Canadians and provides some rather interesting statistics. I didn't post it up for the comparisons it makes but rather to record the statistics as it gives an interesting insight into both countries. For example, the USA has a much higher marriage rate whereas Canadians are more likely to just live together. We've just gone through Canada Day here on 1st July and by the time you get this it will be 4th of July celebrations in the USA... so hope you all had/have a good time. Made a start at a new book, "Soldiers of Fortune" for which more below. I am also looking to start on the "Chronicals of Stratheden" which is great wee book about a typical Highland village in the mid 1800's and its residents. I will also be starting on a book about "Scottish Gardens". Do feel free to suggest topics you'd like to see covered on the site or types of books you'd like to see and if I can find them I'll certainly look at including them. Also want to give another plug to our "Article Service". This is where you can add your own stories, poems, or just comment on any subject you want from gas prices to home mortgages or the political scene. Perhaps even household tips, recipes, and pretty much anything you'd like to offer. You could also post up anything about families and clans, a trip you took to somewhere interesting where you had a good time. The article can really be about anything and it need *not* have anything to do about Scotland. It could also be used as a Blog. When you create an account you will be able to add pictures to your articles and get a url where all your articles will be revealed that you can quote on other web sites or in emails. So do make use of this service and especially if you are doing something you'd like other people to know about. You could even use it to do a book review or add a press release. Should you feel that something you are interested in posting doesn't have an appropriate category or sub category feel free to email me with your suggestion and I'll certainly consider adding it to the service. A fair proportion of this issue is dedicated to the resignation of the Labour Party Leader and surrounding information. There is also an interesting article on the Stone of Destiny. One of the invaluable suggestions by Electric Scotland’s Alastair McIntyre whilst discussing setting up the Flag in the Wind was that there should be a weekly section of Scottish History Dates. This was duly done and at the beginning of June The Flag’s history time-line had reached some 2,100 dates, giving a fascinating glimpse of Scottish History. An ever-expanding feature it gives an interesting back-up to James Halliday’s splendid ‘Scotland: A Concise History’ which you can also find in The Flag’s features. Jean Livingstone, Lady Warriston, daughter of John Livingstone of Dunipace, was beheaded at the foot of the Canongate, Edinburgh, for the murder of her husband John Kincaid of Warriston. Birth of John Hamilton, 2nd Lord Belhaven, leading opponent of the 1707 incorporating Union between Scotland and England. I think I see a free and independent kingdom delivering up that which all the world hath been fighting for, since the days of Nimrod; yea, that for which most of all the Empires, Kingdoms, States and Principalities and Dukedoms of Europe, are at this time engaged in the most bloody and cruel wars that ever were, to wit a power to manage their own affairs by themselves without the assistance and counsel of any other. Miss Duthie, noted Aberdeen benefactor, stated her intention of presenting Aberdeen with a public park to perpetuate the memory of her uncles and brothers. The Duthie Park was officially opened in 1883 by Princess Beatrice. The eighteen radicals taken prisoner at the Battle of Bonnymuir were arrainged. The British airship R34 arrived at Mineola, New York, from East Fortune, East Lothian, becoming the first airship to cross the Atlantic. The flight took 108 hours. The Piper Alpha memorial, sculpted by Sue Taylor, was unveiled by the Queen Mother in Hazelhead Park, Aberdeen. Death of Lord George Murray, outstanding exiled Jacobite commander, in Holland. Colin Montgomery pulled off his first tour victory in 19 months in winning the European Open by one stroke at the K Club, Dublin. Jamie Murray and Jelena Jankevic won the mixed doubles final at Wimbleton with a 6-4, 3-6. 6-1 win over Jonas Bjorkman and Alicia Molik. Murray was the first Scottish winner at Wimbleton since Edinburgh-born Harold Mahoney (usually referred to as Irish) was singles champion in 1896. Police confirmed that more than a thousand antique coins, dating back to 1136 and worth around £500,000, had been stolen from the home of Lord and Lady Stewarthy at Broughton near Peebles. 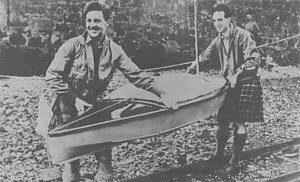 The inspiration for this column came from the historic canoe journey made by Oliver Brown Award winners, Sir Alastair M Dunnett and James ( Seumas ) Adam, from Bowling on the Clyde to Skye in 1934. The expedition led to them being known as The Canoe Boys and the foodstuff which provided the back-bone of their diet, a foodstuff which had sustained Scots for centuries, was oatmeal. They preferred to have it, at least twice a day, in the form of oatmeal brose rather than as porridge. An account of how they made their brose was provided by Sir Alastair M Dunnett in 'Quest By Canoe', the story of their adventure published in 1950 and reprinted in 1995. We are onto the R's now with Reid, Rennie, Renton, Renwick, Richardson and Riddell. RIDDELL, the surname of an ancient Roxburghshire family. The first in Scotland of the name was Gervase de Riddel, who accompanied from England David, prince of Cumberland, afterwards David I., and received from him considerable lands in that county. He was of Norman extraction, his grandfather, the Sieur de Riddel, having come over with William the Conqueror. The latter is particularly named in the roll of Battle Abbey, with “Avenell and Ros,” and lands in various parts of England were bestowed on him by the Conqueror. From Dugdale’s Baronage (vol. i. p. 555), we learn that his son Geoffrey, Lord Riddel, father of Gervase, was lord-chief-justice of England in 1107, and that he married Geva, daughter of Hugh de Abrincas, earl of Chester, of whom descended Matilda or Maud, wife of David, earl of Huntingdon, and grandmother of Robert Bruce the competitor, grandfather of King Robert the Bruce. He perished at sea in the same ship with Prince William, son of Henry I., on their return from France in 1120. His son, Gervase or Geoffrey, was progenitor of the Scottish family of Riddell of Riddell. This Gervase or Geoffrey Riddell was the earliest sheriff of Roxburghshire. He was witness to most of the charters and donations of King David I., and also to the well-known Inquisition made by that monarch when prince of Cumberland, for the old possessions belonging to the church of Glasgow. He died about 1140, leaving two sons, Walter, his heir, and Sir Anketil, who succeeded his brother. And in a note he says, “The family of Riddell have been very long in possession of the barony called Riddell or Reydale, part of which still bears the latter name. Tradition carries their antiquity to a point extremely remote; and is in some degree sanctioned by the discovery of two stone coffins, one containing an earthen pot filled with ashes and arms, bearing a legible date, A.D. 727, the other dated 936, and filled with the bones of a man of gigantic size. These coffins were discovered in the foundations of what was, but has long since ceased to be, the chapel of Riddell, and, as it was argued with plausibility that they contained the remains of some ancestors of the family, they were deposited in the modern place of sepulture, comparatively so termed, though built in 1110.” There is nothing in the discovery of two stone coffins with the respective dates mentioned, to support the supposition that the family of Riddell was settled at that place in the seventh or eighth century, as has been rather hastily assumed. The first grant of land they had in Scotland was in the reign of David I., as above shown, when the first of the name came from England and obtained possessions in Roxburghshire. Topographical Appearances.— On the river banks and level grounds, the prevailing soil is an alluvial deposit of clay-slate or clay. In some places, it is sharp, light, and gravelly, and is very early and fertile. The aspect of the parish is, upon the whole, beautiful; the ground rising from the Doveron towards the south and east, till it terminates in gently undulating fields, bearing in general, in favourable seasons, abundant crops. The hills of Vrae on the north, Cotburn on the east, Darra on the south, and Ardmiddle on the west, are the most elevated. The town is very pleasantly situated, with a fine southern exposure; and although it cannot boast of its spacious and well-formed streets or its public buildings, the houses are substantial, neat, and commodious, and surrounded by little gardens, tastefully laid out, display a degree of comfort and convenience which the inhabitants in general enjoy. Indeed, it has often been remarked by strangers, that Turriff exhibits fewer instances of poverty and wretchedness than most places of the same size. Within the last fifteen years, a considerable addition was made to the extent and population of the town by two streets which were opened; and it is rumoured that additional feus are to be given off upon a more uniform and improved plan than has hitherto been followed. How beautiful to the eye and to the heart rise up, in a pastoral region, the green silent hills from the dissolving snow-wreaths that yet linger at their feet! A few warm sunny days, and a few breezy and melting nights, have seemed to create the sweet season of spring out of the winter's bleakest desolation. We can scarcely believe that such brightness of verdure could have been shrouded in the snow, blending itself, as it now does, so vividly with the deep blue of heaven. With the revival of nature our own souls feel restored. Happiness becomes milder, meeker, and richer in pensive thought; while sorrow catches a faint tinge of joy, and reposes itself on the quietness of earth’s opening breast. Then is youth rejoicing—manhood sedate—and old age esigned. The child shakes his golden curls in his glee; he of riper life hails the coming year with temperate exultation; and the eye that has been touched with dimness, in the general spirit of delight, forgets or fears not the shadows of the grave. On such a vernal day as this did we, who had visited the Elder on his death-bed, walk together to his house in the Hazel Glen, to accompany his body to the place of burial. On the night he died, it seemed to be the dead of winter. On the day he was buried, it seemed to be the birth of spring. The old pastor and I were alone for awhile as we pursued our path up the glen, by the banks of the little burn. It had cleared itself off from the melted snow, and ran so pellucid a race that every stone and pebble was visible in its yellow channel. The willows, the alders, and the birches, the fairest mid the earliest of our native hill-trees, seemed almost tinged with a verdant light, as if they were budding; and beneath them, here and there peeped out, as in the pleasure of new existence, the primrose lonely, or in little families and flocks. The bee had not yet ventured to leave his cell, yet the flowers reminded one of his murmur. A few insects were dancing in the air, and here and there some little moorland bird, touched at the heart with the warm and sunny change, was piping his love-sweet song among the braes. It was just such a day as a grave meditative man, like him we were about to inter, would have chosen to walk over his farm in religious contentment with his lot. That was the thought that entered the pastor’s heart, as we paused to enjoy one brighter gleam of the sun in a little meadow-field of peculiar beauty. "This is the last day of the week, and on that day often did the Elder walk through this little happy kingdom of his own, with some of his grand-children beside and around him, and often his Bible in his hand. It is, you feel, a solitary place,—all the vale is one seclusion—and often have its quiet bounds been a place of undisturbed meditation and prayer." This week added pages about Carriage, Carrier: of disease, Carrier: The Legal Aspect, Carrier Pigeon, Carrier Wave, Carron Oil, Carrot, Carrot Fly, Carrot Pudding, Carrot Soufle, Carrot Soup, Carvers, Carving, Carving, Cascara, Cascarilla, Case Hardening, Casein, Casement, Casement Curtain, Cashmere, Cash on Delivery, Cassareep, Cassava, Casseroles and Casselore Cookery, Cassia, Casting in Iron, Lead and Brass, Casting, Cast Iron, Castle Nut, Castle Pudding, Castor, Castor Oil, Castor Oil Plant, Castor Sugar, Cats, Cat, Catalepsy, Catalpa, Cat and Mouse, Cataract. ALLAN and Tom would get a great ovation in St Andrews when they returned victorious from the match I described in my last chapter. The splendid and unexpected victory which they won was enough to stir the placid atmosphere of the old city, and to set the small but select society of golfers talking and boasting of the prowess of the two St Andrews champions of golf. And it was a quiet little St Andrews in those days. There were, of course, always a few regular residents in the old city who played every day, and now and then their number would be augmented, their golfing form stirred and their hilarity increased by "visiting brethren" from Musselburgh, Leith and Perth links. There was no Club-House as a sumptuous rendezvous then. The players met in the small Union parlour in Golf Place about noon, and the matches for the day were arranged. And then out to play. If the matches were concluded 3 or 4 holes from the home green, they would at once turn and commence; their second round, taking a glass of ginger-beer mixed with something stronger if they had it with them in their flasks, and "a snack" or sandwich at the fourth or "Ginger-Beer" hole. Did the necessities of the match bring them to the home hole, they would visit the Union parlour for a quarter of an hour and take the slight refreshment they allowed themselves there. They then started on their second round, which would be finished by four o'clock, in plenty of time for their five-o'clock dinner. I might add to this that I remember the golfer John Panton, who was the professional at Glenberview near Falkirk. He never drank anything alcoholic and his favourite drink was a Ginger Beer with a dash of lime cordial. IT is difficult for us, in the days in which we now live, to realise the fact that at one time, not only in our own parish, but throughout Scotland, belief in witchcraft was universal. It is still more difficult to believe that numbers of wretched creatures of both sexes were accused of this imaginary crime and put to death, in many cases with cruel tortures. By an Act passed in the ninth Parliament of Queen Mary, it was declared 'that witches, or consulters with witches,' should be punished with death. For many years afterwards, as a consequence of this enactment, every effort appears to have been made to hunt out and bring to their doom those unfortunates who believed themselves, or were believed by others, to be possessed of supernatural powers through the influence of Satanic agency. In many places the parochial clergymen were the most active instruments in bringing suspected sorcerers to justice, and it is possible that, in the cases I am about to quote, the Rev. Mr. French of Penicuik was the informer, both to the civil power and to his brethren of the Dalkeith Presbytery, of the existence of sundry dangerous characters in his own parish. The preliminary proceedings cannot now he ascertained, but the proof must have been very strong, for a short shrift was given to the poor unfortunates so denounced. A minute of Preslbytery, of 17th September 1629, states that the Court appointed the Revs. James Porteous, John Knox, and Thomas Couplan to be present in Penicuik at the execution of Christian Thomson, Isobel Dryburgh, and Margaret Smail, arraigned for witchcraft. In this short and abrupt way is a matter involving the death of three of their fellow-creatures thus disposed of by the Fathers and Brethren of those days. Sad to think that such a scene should have been witnessed in our parish, and that men who by their position and education ought to have been the first to disabuse the minds of the people of such absurd delusions, should have been the most active in aiding and abetting such horrid cruelties. Nor does this complete the dismal story, for at another meeting of Presbytery, held on 18th December of the same year, a deputation, who had again visited Penicuik, report that they had personally superintended the burning of Janet Bishop, Janet Pennycuick, and Margaret Endherson, who had been condemned to death for the same crime. Local tradition fixes upon two different sites as the ground upon which these fearful scenes were enacted. It is more than likely, however, that it was in the churchyard that the stakes were erected, and the coals, the heather, and the gunpowder built round them to do their fatal work of reducing to ashes the quivering bodies of these poor victims. Carron Iron Works—How the Poet Burns solaced himself on being refused admission to the Works—A Royal Visitor--Pot-making and the Pot-makers—Falkirk Iron Works, and their Productions—Artistic Castings—Morrison's Ventilating Fire-place—The Malleable Iron Trade —Puddling, Shingling, and Rolling—The Lancefield and Parkhead Forges—Gigantic Smith-work—How the Shafts for Screw-Steamers are made. Scotch Shipping before the Union—The "Great Michael"—Effect of the Union on commerce—Story of the First Steamer, and her immediate successors—The Inventors and Improvers of Steam-vessels—Miller, Taylor, Symington, Bell, and Napier—Origin of Building Ships of Iron—Rise and Progress of Shipbuilding on the Clyde—Messrs R. Napier & Sons—Shipbuilding at Leith, Aberdeen, Dundee, &c.—Statistics of the Trade. Infancy of Railways—First Railway in Scotland—The Kilmarnock and Troon Line—Formation of a Railway between Edinburgh and Dalkeith—"The Innocent Railway"—Early Locomotive Engines—Experiments and Discoveries—Railways and their Advantages foreshadowed by Mr Charles Maclaren—Road Steamers—Progress of Railways in Scotland—The Railway Mania—Extent, Organisation, and Traffic of the Scotch Rail-ways—How the Rolling Stock is made and upheld—The North British Company's Workshops at Cowlairs—Work and Wages of Railway Servants. Introduction of Coaches into Britain—Sedan Chairs and Hackney Coaches in Edinburgh—The First Stage Coach between Edinburgh and Glasgow —Extension of Stage Travelling to London—Impetus given to Travelling by improving the Roads—Difficulties of Early Travellers—The Coach- making Trade in Edinburgh—How Carriages are made and equipped —Coachmakers and their earnings. Native Gold in use among the early inhabitants of Scotland—Gold Mining at various Periods—Proofs of the Existence of Gold in many parts of the Country—Plate and Jewellery in old Scotch Families—George Heriot—Enactments for the Regulation of Workers in the Precious Metals—The Edinburgh Incorporation of Hammermen—How articles of Silver are Made—Chasing, Engraving, Casting, and Electro-Plating —Jewel-Making, Gem-Setting, Gold-Beating, and Seal-Engraving —Edinburgh as a seat of the Plate and Jewellery Trades. Machine-Making—The Amalgamated Society of Engineers—The Iron- Moulders and their Union—Copper found in Scotland—Working in Copper and Brass—Milton House Brass-Foundry and Metre Factory— Lead Mining in Scotland—Manufacture of Lead and Tin Tubing— Messrs Miller & Richard's Type-Foundry—Type-Making by Machinery. History of the Scotch Woollen Trade—How the people dressed in 1598 —Early Statutes for the Encouragement of Woollen Manufactures— State of the Trade in 1733 and 1778—The Scotch Tweed Trade—The Manufacturing Processes—The Manufacture of Hosiery, Carpets, &c.— Notes on the Chief Seat of the Woollen Trade. THE sword has always been the resource of the adventurous or impecunious, and the roll of celebrated soldiers of fortune is so long that the choice may be much a matter of fancy or predilection. But there were epochs when the trade was exceptionally flourishing, there were times when men were typical or when circumstances forced them to the front, as there were illustrious careers sensationally dramatic. So there is justification for a selection not altogether arbitrary. One naturally begins with the medieval Condottieri and as naturally ends with the Indian Adventurers, their modern representatives. The war which for thirty years desolated Europe saw the developments of a science then in its infancy, with a revolution in the methods of campaigning. Our countrymen, and especially the Scots, had a special interest in that war from the numbers who flocked to the standards of the Lion of the North, the Catholic League, or the Empire. Of the many Scottish soldiers of fortune, Marshal Keith of the next century was by far the greatest. All are familiar with him as one of Frederick's most trusted lieutenants, but less is known of his concern in the Jacobite intrigues, and as little of the vicissitudes of his life in Russian camps and courts, where, after rising to the highest rank, his Scottish caution saved him from the scaffold or Siberia. Eugene, born with the very genius of war, was rejected by the country of his adoption in an evil hour for France. Soldier and statesman, diplomatist and man of letters, from the Meuse to the Danube, from the Alps to the Apennines, he commanded under greater difficulties and in a greater diversity of campaigning than his friend and colleague Marlborough, and the career of the Edler Ritter of the camp songs was a romance from be-ginning to end. Romantic as it was, it was surpassed by that of Maurice of Saxe, born, like Eugene, almost on the steps of a throne, and scarcely embarrassed by the bar sinister. Distinguished by supreme talents and degraded by his follies, no ambitious hero ever missed more magnificent opportunities, when a choice of marriages might have made him Emperor of all the Russias. He had to console himself with the baton of a Marshal of France, where he died with the reputation of the first soldier of the age, crowned with laurels and overwhelmed with the honours ordinarily paid to royalty alone. This week we've added bios on Charles McLaren, John Goodbrand, and John Campbell. Duncan Macintyre was a favourite with the people. On his journeys throughout the Highlands his fame preceded him, and he was generally well received. His handsome presence and frank bearing, his cheerful countenance and sociable disposition, were all conducive to hospitable entertainment. Of a peaceable, happy-go-lucky disposition, he was mild-mannered as a rule but merciless in retaliation for insult, and uncharitable to opponents. He apparently enjoyed the tours he made through the Highlands and Islands. In his younger days he was, by choice or by chance, a wanderer, a welcome minstrel in different places — toirt òrain ùra ‘s rannachd dhaibh — and so became known and loved as Donnchadh bàn nan òran. The bard of Glen Orchy had known wild and lonely places, he lived in shielings and gamekeepers’ huts, and he was familiar with all phases of farm work and rural pastimes. He had observed men toiling and striving all their days and came to the conclusion gur e ‘n duine diomhain as fhaide mhaireas (that ‘tis the idle man that doth last longest). He had followed his own recipe for longevity long before he left Glen Orchy; and we may rejoice it was so, for sustained poetic composition requires leisure and contemplation and the mental concentration that weariness makes difficult. He hoped that his duties in the City Guard would leave him many spells to be "in vacant or in pensive mood." Actually, Conditions in the capital were not favourable: there were too many opportunities for company and too few for privacy. Macintyre made his home in the capital for half his life-time; here some of his children were born and some died; and here he himself passed away in 1812, and his wife in 1824. The poet and his wife, and some of their children and grandchildren are buried in Old Greyfriars churchyard. His monument here marks a spot that will ever be sacred to all who speak the Gaelic language and appreciate the grace and grandeur of the songs bequeathed to them by Duncan Ban Macintyre. It is said that what Burns was to the Scots, MacIntyre was to the Highlanders.